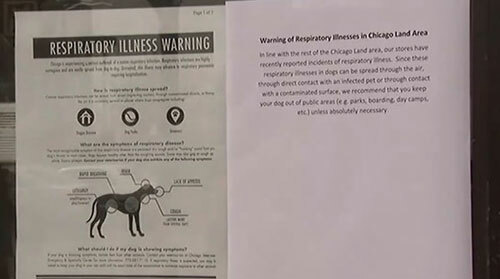 You may have heard about the potentially deadly dog flu outbreak that is sweeping through Chicago and surrounding areas. Now comes the news it has infected cats as well as dogs. It’s widespread enough that the Chicago Anti-Cruelty Society had to cancel their annual 2015 Bark In The Park fundraiser (“Bark In The Park 2015 Canceled by Dog Flu Outbreak“). Dogster.com reports PetSmart has closed its three Chicago PetsHotel boarding facilities and warning signs have been posted in Chicago-area parks. Before you panic we recommend that you read this article from Dogs Naturally (“The Dog Flu Epidemic: The Real Truth“). Be aware that their focus is on dogs, but in this case it applies to a dog as it will apply to a cat. We like this magazine because they offer very well researched articles with a wholistic view point. And, yes, what the say about vaccinations is eye opening – a must read for everyone who thinks that vaccines are harmless, and will protect us from anything and everything. Don’t miss the part about the “seeding” pharmaecutical companies do in advance of any product launch. In the article Karen Becker, DVD recommends giving dogs garlic and essential oils to boost immunity. This could be a dangerous mistake for cats. Both garlic and essentials oils can be very toxic, even a drop of some essential oils can be lethal for a cat. We recommend Colloidal Defense for its virus killing ability and immunity boosting. If your cat or dog exhibits any of these symptoms, isolate them, then please call your vet immediately! Sale on Urine Cleanup Products Ends Tonight at Midnight! All Anti Icky Poo cleaning products (Anti Icky Poo, P-Bath, Stain Remover) are still on sale! If you’ve used Anti Icky Poo urine cleaner before, you know it works! If you are new, get ready to be delighted – this is THE ONE that really works. How and why does it work? It literally eats the urine proteins and gases, which means odor is gone baby gone! For your nose and the cat’s nose. You might need P Bath to pre treat if you used anything anti microbial in the past or if the stains is especially old and gross. Generally Anti Icky Poo alone is enough to remove the yellow, but if it wasn’t enough, then get Stain Remover. Reclaim your home! Get rid of that awful kennel smell! Sale on Urine Cleaning Products Still On! Urine Cleaning Products Still on Sale! But act fast, the sale ends in 8 days at midnight on Thursday October 2. Sale on Urine Cleaning Products! 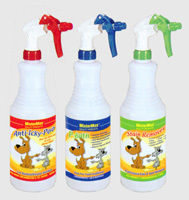 All Anti Icky Poo cleaning products (Anti Icky Poo, P-Bath, Stain Remover) are on sale! But act fast, the sale ends in 10 days at midnight on Thursday October 2.